This past Sunday was Easter Sunday and my mom asked me to bake for her church because she was in charge of food & hospitality for the month. I gladly obliged since I love any excuse to bake large quantities of baked goods that are specially decorated! 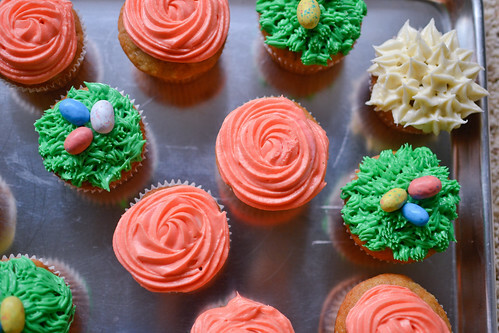 It’s easy to bake on any given day, but it’s hard to be motivated to actually decorate something. 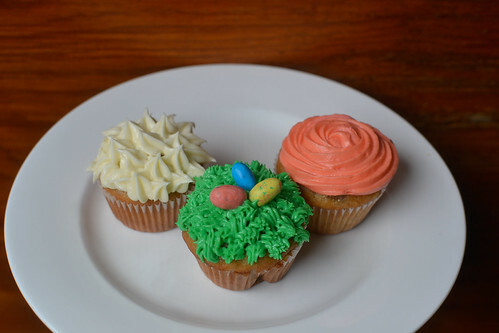 I really enjoy frosting cakes and cupcakes because it makes me feel like an artist, like I’m actually being creative. If you know me, you know that I lack skill in other forms of art. Stick figures are about the closest I can get to drawing humans and my drawings of animals resemble deformed aliens. 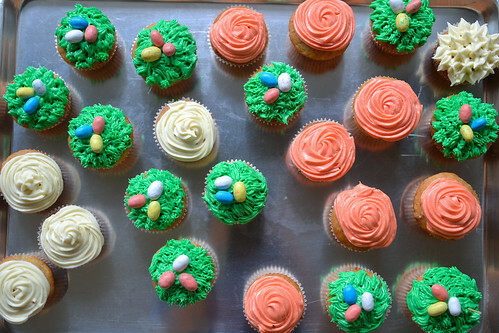 So though I’m not an expert at it, I find joy and excitement in decorating cakes and cupcakes. The most important thing when it comes to making cream cheese frosting, is making sure that the butter and cream cheese are soft. Always take it out of the refrigerator and let it come to room temperature for at LEAST an hour. You can slice them into smaller parts to allow them to soften quicker. DO NOT microwave it! Even if you microwave it quickly, some water will separate from the butter and will change its structure. Beat the butter and cream cheese with a mixer for a few minutes until creamy. Get rid of those lumps! No one likes lumpy frosting! Add the vanilla and incorporate. Add the powdered sugar in 1 cup increments, beating after each addition. Voila! 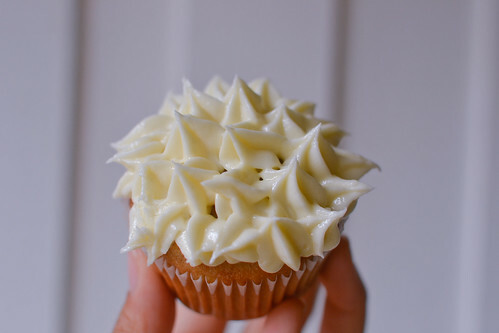 You get creamy cream cheese frosting! For this cupcake, I added some green dye to my cream cheese frosting and just kept mixing until I liked the color (about 6 drops per one cup of frosting). To make the grass, I used my 8 in. piping bag and a Wilton grass tip #233. If you use Ateco brand tips, it’s #133. The Wilton link above has great tips on piping technique. 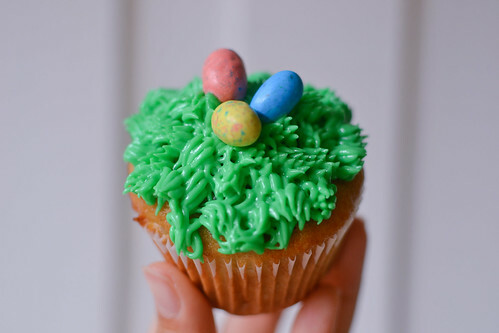 Pipe the grass upward in the middle and then start piping outward as you move away from the center of the cupcake. 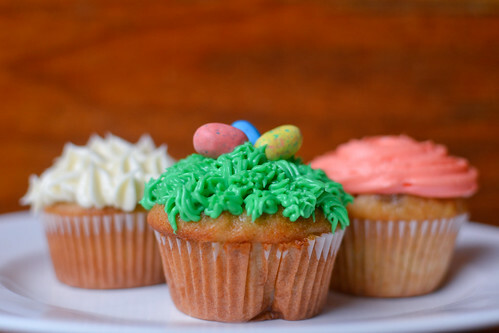 The key is to first stop applying pressure to the piping bag, then lift the tip off the cupcake. Don’t lift while still applying pressure, or else it gets everywhere and ruins the precise grassy shape. Then top it with chocolate eggs! I wanted to use M&M eggs but Target ran out :(. Luckily, just about every other chocolate company makes eggs around Easter time so I used whoppers! There are many different techniques for piping roses, and this is probably the simplest one. 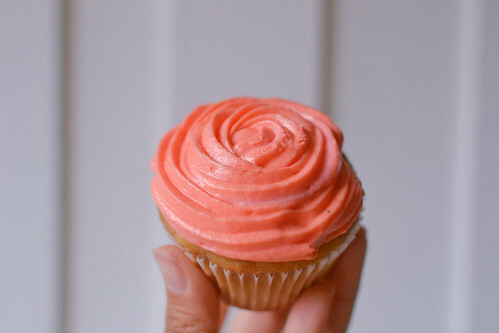 To make this color, I added 11 drops red and 3 drops yellow to one cup of the frosting. I used the Wilton 1M open star tip (Ateco #826) and started piping on the CENTER of the cupcake and then piped around it until I covered the entire cupcake. I’ll have to try other techniques and piping tips and definitely practice before I can say that I’m totally satisfied with my rose-piping! I only made one of these and because I just wanted to switch the tip and practice with my other ones. I believe I used Wilton #190 and piped it using the same technique I used for the grass. I started in the middle and piped upward. To create drop flowers, I believe you’re supposed to stop applying pressure and then pull the tip away. BUT I kept applying pressure as I pulled the tip away, hence the taller peaks on each flower (I hope that made sense. I’m new to piping talk! :/). Well enough of the baking talk, here are more pictures! I thoroughly enjoyed making these, and it brings me even more joy to know that others appreciated them as well! Hope you all had a joyful Easter!